Getting a custom home screen for your Android device is a great idea. But if you don’t have enough time to spend on that right now, you can give the existing home screen a mini makeover with a fresh wallpaper and a new icon set to match. We recently posted an in-depth tutorial on how to create a gorgeous Android home screen How to Make Your Own Uniquely Gorgeous Android Home Screen How to Make Your Own Uniquely Gorgeous Android Home Screen Here's a detailed look at the whole process. If you follow it step by step, you can get the same eye-catching home screen for your device and learn to experiment with design recipes. Read More for yourself. If you want to save that process for another day, but still want to brighten up your home screen, the following method can work as an excellent stopgap solution. What’s more, it’s quick and easy. All you need is a nice wallpaper, a launcher app, and a set of icons that will go well with the wallpaper. Here’s a brief overview of how you can achieve this simple transformation. If you find a sleek wallpaper for your device, the task of revamping your home screen is already half done. With plenty of cool sites that provide wallpapers for Android devices, finding a wallpaper to suit your tastes shouldn’t be too difficult. Wallbase (review here Wallbase For Android: One Of The Best Ways To Find Beautiful Wallpapers On The Go Wallbase For Android: One Of The Best Ways To Find Beautiful Wallpapers On The Go Wallpapers are fun, and they're also one of the best ways to customize and personalize your tech. Today I'm here with an app we haven't looked at yet: Wallbase, the mobile companion for the venerable... Read More ) can give you a wide range of wallpaper choices. Once you have downloaded a suitable background image to your device, it’s time to apply it to your home screen. To do that, long-press the home screen, select Wallpapers from the menu that opens up, and navigate to the location where you have saved the downloaded wallpaper. Select the wallpaper image and tap on Set Wallpaper to display it on your home screen. I opted for a dark, soothing wallpaper I found in a MyColorScreen recipe. Thanks to so many skillful and generous designers who’re in our midst, there is no dearth of both free and reasonably priced, beautiful icon sets on the Web, and in our case, on the Play Store. No matter which wallpaper or color scheme your home screen has going on at the moment, you’re sure to find some icon set that complements it. If you don’t know where to begin, try Kannon’s roundup of five custom icons packs 5 Stunning Android Icon Packs to Beautify Your Android Device 5 Stunning Android Icon Packs to Beautify Your Android Device Looking to beautify your Android icons, but don't want to pay money? I tested out a large number of free custom icons packs and found five of the best you can find anywhere — without... Read More . Install one of the icon packs you like, from the Play Store. I wanted the screen to be clutter free except for the dock, notification bar, and the clock widget. To keep things from looking too dull, I used Nova Launcher to replace the colorful yet mismatched default icons with those from the Tiny White Icon Pack. Android’s native launcher isn’t very customizable. That’s one of the reasons why third-party launchers are such a hit. For our experiment, you’ll need one such launcher that allows for icon pack switching. 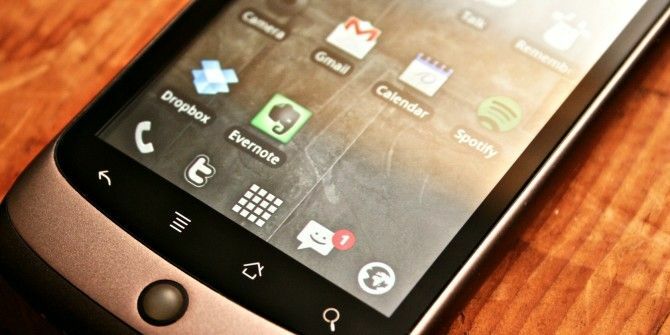 As a starting point, you can use one of the several well-known launchers Transform Your Droid: 5 Launchers To Replace The One That Came With Your Phone Transform Your Droid: 5 Launchers To Replace The One That Came With Your Phone Android launchers are a great way to spice up your home screen with new graphics and new features. For the uninitiated, you should know that your phone already has its own stock launcher, but stock... Read More that we have covered. Note that certain icon packs are compatible only with certain launchers. If you like one that’s incompatible with your current launcher, either get a new launcher or look for a new icon pack. For the purpose of this post, we’ll be looking at changing icons in three of the most popular launchers – Nova Launcher, Apex Launcher, and ADW Launcher. Long press the home screen to access the Add to Home Screen menu and tap on the wrench icon at the top right. This brings up the Nova Settings screen, which is also accessible from the App Drawer if you have set Nova Launcher as the default launcher. Tap on Look and Feel in the settings screen. Then, in the screen that appears, you’ll see Icon Theme as one of the options. Select that to see all the icon packs available on your device in the Icon Pack menu. Tap on the one you installed at the start of this experiment, and voilà! All the icons in the App Drawer and their shortcuts on the home screen have now been changed to icons from the set you chose. If you want to switch back to the default pack or try a few more icon sets, just pick the relevant pack from the Icon Pack menu. That’s all there is to it. Long press the home screen and select Apex Settings from the menu that pops up. In the subsequent screen, pick Theme Settings, which leads to a list of the available icon packs. Tap on the icon pack that you want to use. This opens up an information screen for that pack. Tapping on Apply in this new screen changes the existing icon set to the new one all across the system. Browse more themes for the Apex Launcher using the Get More Themes option on the Theme Settings screen. Begin by long pressing the home screen to fire up the ADW Config box, where you’ll find a 2×3 grid of ADW options. Tap on ADW Settings in this grid, which will direct you to a two-column screen with a long list of settings. Find Themes in the navigation section (the column on the left) and tap on it to reveal a list of all the available themes, including the new icon pack that you have installed. Tap on that icon pack and select Apply in the theme information screen that follows. As my frequently used apps like the browser 5 Simple Ways to Choose the Best Mobile Browser for You 5 Simple Ways to Choose the Best Mobile Browser for You Choosing a browser for your mobile device, whether Android or iOS -- which one do you choose? If your head spins from the variety of mobile browser options, then ask yourself these five questions. Read More , file manager 3 Little-Known Android Apps to Keep Your Files and Folders Organized 3 Little-Known Android Apps to Keep Your Files and Folders Organized Still on the lookout for a good file manager for your Android device? Maybe it's time to test drive some of the lesser-known options. Read More , email client, text editor, and the music player are among the lesser known options in their category, they did not have themed replacements in the icon pack that I had chosen. After installing the new set, these unthemed icons retained their original look and matched the themed set only in size. Mixing up the white and colored icons would have looked odd, so I kept them on separate screens. In the split screenshot below, the image on the left is how my home screen looked with the default icons and wallpaper. The image on the right is how it looks after changing both these design elements. Whether you look at your Android home screen a hundred times a day or just once a week, when you do look at it, isn’t is nice to have a beautiful one looking right back? Maybe you want a temporary solution till you get around to customizing your home screen, or maybe fiddling with wallpapers, widgets, and endless settings is just not for you. In either case, you can still add some graphic pizazz to your Android device with the simple process outlined above. Have you experimented with icon packs? Do you have any favorites to suggest? Let us know in the comments. We’re listening.